1 Bedroom Flat For Sale in for Guide Price £285,000. 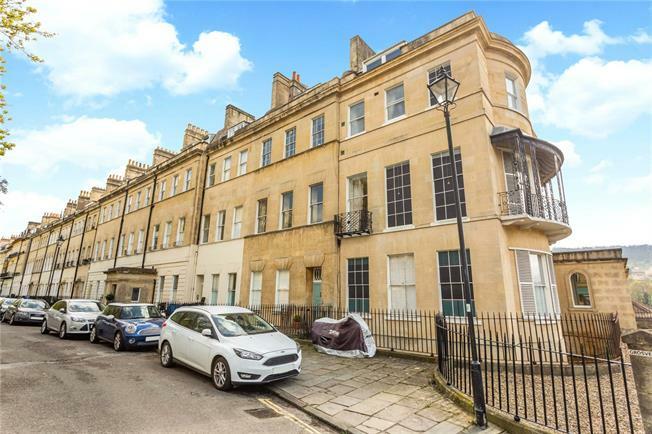 The super one bedroom apartment is self-contained on the second floor of a Grade I Listed townhouse that forms part of an impressive terrace with far reaching views to the rear. The smart and tidy communal hallway offers a good impression when entering this handsome city home. The private entrance hall opens into a drawing room with two tall sash windows looking out to the greenery and activity to the front of the house. Adjacent is a bespoke kitchen with well-designed handmade units, storage shelves and a dresser that is the perfect fit. There is still enough room for a breakfast table. The bedroom to the rear is a wonderful light and airy room with plenty of space for a seating area by the window to relax and enjoy the views across the valley to the hills beyond. This fashionable apartment is very well presented with a stylish interior design and period features including plaster detail on the coving, plus tall sash windows with working shutters. Grosvenor Place is a handsome Georgian terrace on the east side of Bath. To the front is a wide grass verge lined with mature trees and a slip road with privacy from the London Road. The slip road also provides on-street parking with further parking on the surrounding streets. Larkhall is situated on the other side of the road and is a very sought after neighbourhood with its wonderful community atmosphere centred around the square. The popular amenities include a local theatre, primary and secondary schools, St Saviours Church, and a number of shops including butchers, grocers and a delicatessen, plus a small supermarket. To the rear is access to meadows leading through wonderful countryside to the Kennet and Avon Canal and the River Avon. It is a level walk of approximately one mile to the city centre which offers an array of cultural and leisure amenities. Bath has a unique blend of old and new offering breath-taking architecture alongside a cosmopolitan lifestyle. The city hosts some of the best shops, restaurants and leisure facilities outside of London. The Bath Spa Railway Station has a high speed train service operating to London Paddington (approximately 90 minutes). Junction 18 of the M4 is easily accessible from Grosvenor Place and is approximately 10 miles. Bristol International Airport is approximately 20 miles. Term of Lease: 999 years from 29.09.1990. Services: All mains connected. Service Charge: £1,320.00 per annum. Ground Rent: £100 per annum. Council Tax Band C.